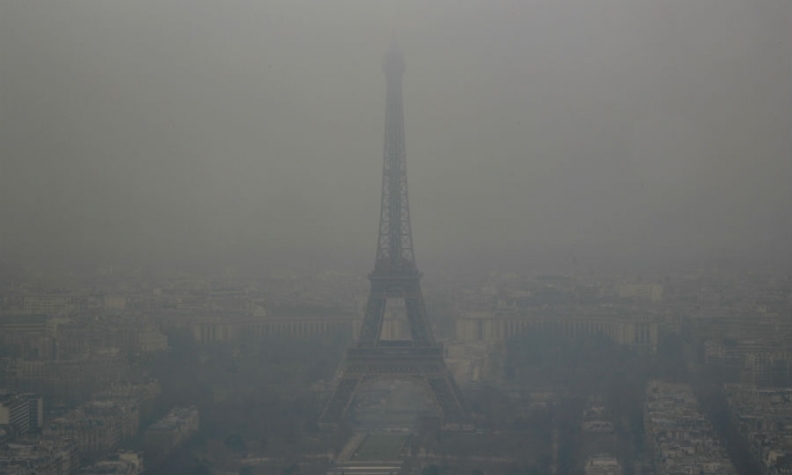 The Eiffel Tower is shrouded in fog caused by low temperatures combined with pollution. PARIS -- Authorities in Paris plan to ban combustion engine cars by 2030, including those fueled by both diesel and gasoline. The news marks an acceleration in plans to move to electric vehicles in a city often obliged to impose temporary driving bans due to surges in particle pollution in the air. Paris City Hall said in a statement that France had already set a target date of 2040 for an end to cars dependent on fossil fuels and that this required speedier phaseouts in large cities. "This is about planning for the long term with a strategy that will reduce greenhouse gases," said Christophe Najdovski, an official responsible for transport policy at the office of Mayor Anne Hidalgo. "Transport is one of the main greenhouse gas producers so we are planning an exit from combustion engine vehicles, or fossil-energy vehicles, by 2030," he told France Info radio. The French capital had already been eyeing an end to diesel cars in the city by the time it hosts the Summer Olympics in 2024. Paris City Hall is already under attack over the establishment of no-car zones, car-free days and fines for drivers who enter the city in cars that are more than 20 years old. It said it was not using the word "ban" but rather introducing a feasible deadline by which combustion-engine cars would be phased out. Many other cities in the world are considering similar moves and China, the world's biggest polluter after the United States, recently announced that it would soon be seeking to get rid of combustion-engine cars.